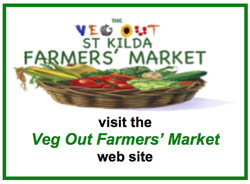 Veg Out Community Gardens St Kilda Inc.
We receive many enquiries regarding student research papers and projects. We are all volunteers at Veg Out – so we regretfully do not always have the time to follow up student phone calls, be interviewed or fill out questionnaires. If you want to use Veg Out in your research project, we suggest you come down in person on the first Sunday of each month (our working bee day), from 11am until about 3pm. Many of the gardeners attend then, as well as key office bearers, so you should be able to ask your questions and find people to assist you with your research.